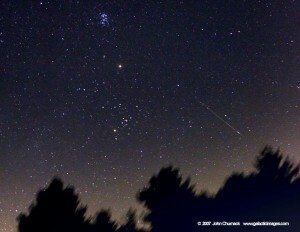 A view of the Perseid Meteor shower and Taurus over the eastern horizon. The Pleiades star cluster is at top, with reddish Mars at the center, and the bright orange star Aldebaran anchoring Taurus towards the horizon (Photo credit: APOD, John Chumack). Step outside on a clear winter night in the northern hemisphere and look for the constellation Taurus, and you will find the famous bull situated between the constellations Aries, Gemini and Orion, flanked by the Pleiades and Hyades star clusters. This region of the sky is popular for star-gazers and astronomers alike because of the variety of objects that reside in this direction. By observing light at a range of wavelengths, astronomers have found that Taurus is an ideal laboratory for understanding the evolutionary stages of young stars. 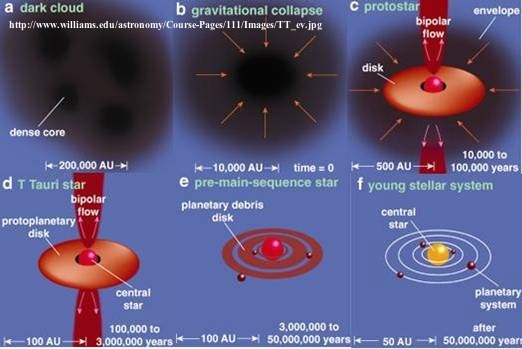 First let’s review the evolutionary stages that a young stellar object (YSO) passes through as it evolves in its first (approximately) million years. The origin of a YSO is in a giant molecular cloud which begins to fragment and condense into gravitationally bound objects. A forming protostar progresses through stages (called 0, I, II, III) towards the main-sequence, when it becomes hot enough to burn hydrogen in its core. During these pre-main-sequence stages, gas and dust from the surrounding cloud (a.k.a. envelope) fall onto the star via a circumstellar disk, and in the meantime momentum is conserved by a small, but significant, fraction of the material being ejected outward (more about the momentum problem can be found in this astrobite). The nomenclature can get somewhat confusing (and quite frankly, often times mixed up) in the literature, but generally, the “Class” of a protostar is determined by observed quantities such as luminosity at different wavelengths, and “Stage” is determined by the ratio of mass that has already formed part of a star, compared with the mass reservoir (envelope) surrounding the young star. Following the terminology most used in today’s paper, I will refer to “Classes” when talking about specific sources throughout the rest of this astrobite. Cartoon of star formation, showing the molecular cloud that begins to gravitationally collapse, forming a Class 0/I star in the upper row, and progressing through Class II (a.k.a. T Tauri star), pre-main-sequence and finally stellar system (with planets forming from the dusty surroundings) on the bottom row. Theory predicts a correlation between the amount of material accreted onto a young star, and the amount of material ejected outward in winds or jets. Hence, observing the amount of mass ejected from a young star is a good way to infer how it forms. Observationally, several of the ejection components have been linked, but with some uncertainty. For example, strong jets of atomic material moving at velocities of several hundreds of km/s have been detected with optical and near-infrared wavelengths, suggesting temperatures of 10000 K, and in the same regions millimeter-wavelength observations show cold (10-100 K) and slow (tens of km/s) molecular gas set into motion by these optical jets. But, several cases are known of hot molecular gas moving at very high velocities, which seem to complicate the simple formation picture. Where do these molecules originate, and how are they accelerated outward, while a young star is accreting material and forming in the meantime? In astronomy, many processes will take longer than the average astronomy career (remember, even the pre-main-sequence can last millions of years), and so rather than being able to stare at a single object and understand how it evolves, astronomers must be creative in order to study evolutionary processes. The authors of today’s paper have found that within Taurus, objects are currently forming over a range of evolutionary stages. Instead of looking at just one object, they observe several and formulate an evolutionary scenario for star formation by comparing the observational characteristics of these sources which are at different evolutionary stages. 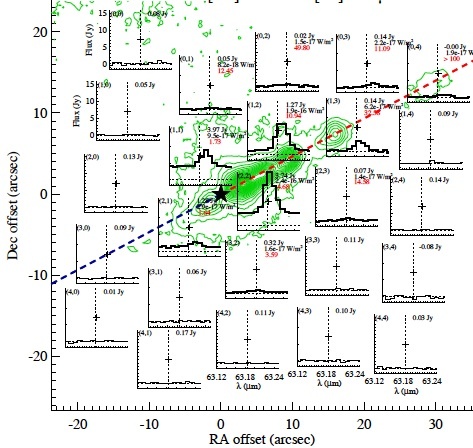 The authors decided to observe several sources in far-infrared (FIR) light because prior to Class II all sources are expected to emit FIR radiation, but with differing amounts based on the rate of accretion/emission. Some of these sources had been previously observed in other wavelengths, such as optical with the Hubble space telescope, shown in the figure below. Optical radiation, with shorter wavelengths and hence more energy than FIR radiation, is emitted from the regions of dense, hot gas and shocks. It tells part of the ejection/accretion story, but not the whole story. 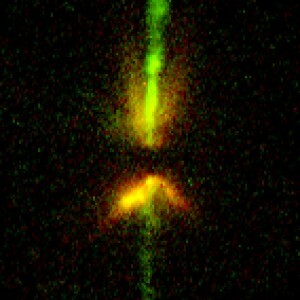 DG Tau B, one of the objects observed in this paper, seen in optical light with Hubble Space Telescope. The same source, as seen in FIR with Herschel, is shown in the next figure (the Hubble image is rotated compared with the Herschel image). 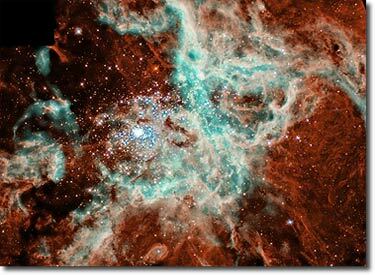 (Credit: Chris Burrows (STScI), the WFPC2 Science Team and NASA). The FIR radiation is emitted from regions of warm gas, at the interface of the cool and hot gas components previously mentioned. 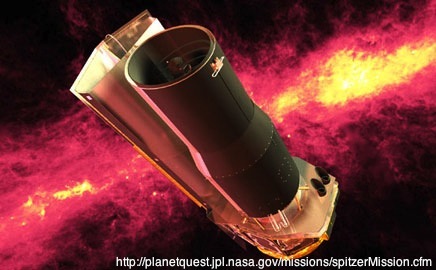 In this study, the atoms oxygen and carbon, as well as the molecules CO, H2O and OH were detected at wavelengths between about 60 and 190 microns (more than 10x longer than optical wavelengths) with the PACS spectrometer on board the Herschel space observatory. These observations are part of the “GAS in Protoplanetary Systems” (GASPS) project with Herschel. 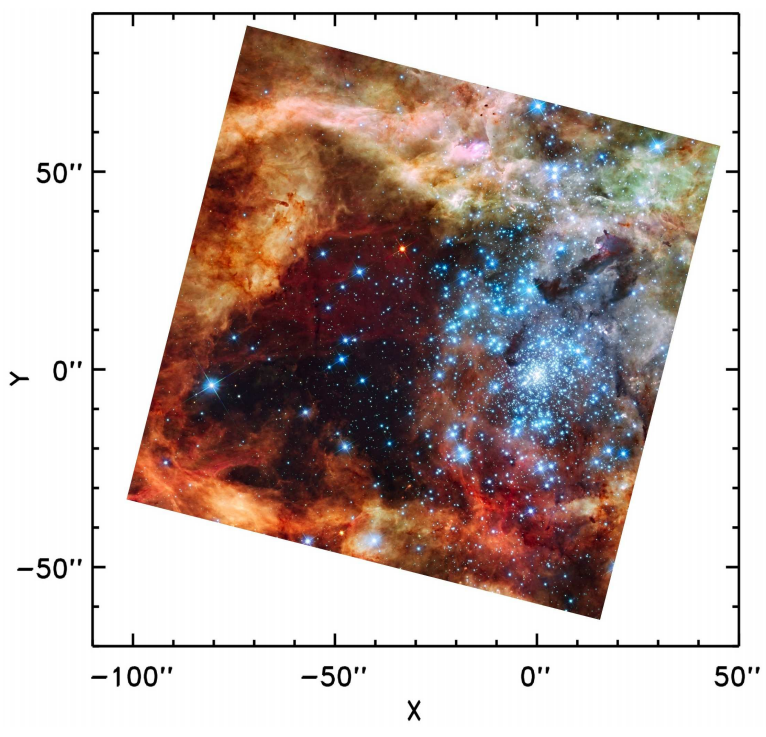 To explain the physical origin of radiation that was detected, the authors compared the observations with models of protostars with different characteristics (such as mass, temperature, luminosity, disk composition), and they calculated how much radiation at each wavelength they could expect from each protostar. The paper presents five (several are binaries) pre-main-sequence sources in the Taurus region which span the protostar evolutionary Classes I and II. These objects were chosen because they were previously known to emit optical light from a jet component (although of varying strength), implying that they are simultaneously accreting as well as ejecting gas into their surrounding environment. Among these sources is T Tauri, the prototype for which the class of pre-main-sequence stars is named. While several of these sources had been well studied in optical wavelengths, Herschel observations were 100-1000 times more sensitive in the FIR than previous observations. One theory of protostar evolution is that a disk may be responsible for radiating very strongly as material is accreted onto a forming protostar. In fact, none of the physically motivated disk-only models that the authors create can explain the amount of radiation that is observed. For the Class I and II sources in Taurus to be emitting as they are, other processes must be involved. The combination of atomic and molecular radiation detected indicate that two components of gas, warm and hot, are present in the protostellar environment. As the hot, fast atomic gas is shot outward in jets, it encounters and shocks the warm molecular gas in the dense environment, producing radiation that depends on the velocity, density and gas composition of the interaction. As for the evolutionary picture, the FIR emission decreases with evolutionary stage, meaning that outflows are more efficient at radiating away energy during earlier classes. This is likely because mass is emitted at a higher rate during the earlier classes as well. Although the authors don’t draw a firm conclusion, they suggest that the ratio of mass ejected via jets and accreted via the disk remains constant for Class I and II sources. Figure 2 from Podio et al. (2012): The Herschel PACS view of DG Tau B shown with the spectra may not be as beautiful as the Hubble view (above), but it tells exactly how much oxygen is present, and where. The FIR oxygen emission (shown with spectra) seen with Herschel, coincides with optical sulfur emission (shown with green contours) reported by Eisloffel & Mundt (1998).